Cooperator Joe Hanania reviews information about berms, flood walls, and deployables. You have one more chance to examine and discuss design concepts for pedestrian bridges across the FDR Drive Tuesday evening at 6:00 pm at Grand Street Settlement at 80 Pitt Street (one block north of Delancey). 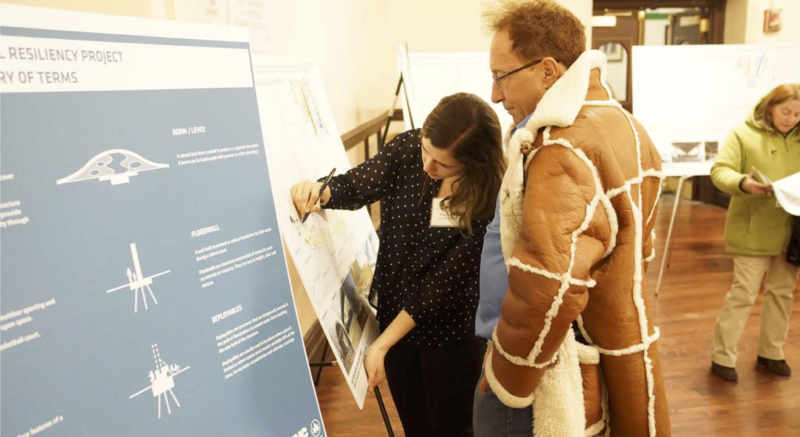 The concepts presented have sparked debate among cooperators about how much the Delancey Street crossing should or should not be redesigned to create an easier access from Grand Street. If you haven’t had a chance yet to see the models and hear the project planners talk about the different options, please make some time Tuesday to familiarize yourself with and offer your opinion about the plans. Later this year, project planners will be proposing a more specific set of recommendations for the waterfront from Montgomery Street to 23rd Street. While public feedback will be a part of that design phase as well, now is the best time to make your voice heard.